If your child loses a baby tooth early through decay or injury, the child's other teeth could shift and begin to fill the vacant space. When your child's permanent teeth emerge, there's not enough room for them. The result is crooked or crowded teeth and difficulties with chewing or speaking. Space maintainers are small appliances which are either fixed or removable type, used to maintain space in the jaws if a milk tooth is lost or removed prematurely. 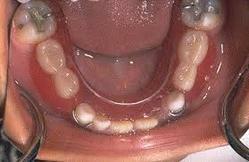 When milk teeth are extracted for any reason (extensively broken down teeth) the space has to be maintained until the permanent teeth erupt into that position. Occasionally it may take upto 5-7 years. There are different types of space maintainers. 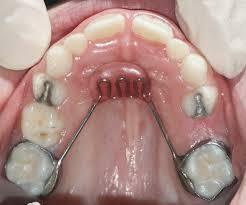 If these appliances are not used, alignment of teeth may be severely hampered in the future. Children may need space maintainers if they lose a tooth early or have a baby (primary) tooth extracted due to dental decay. If either is the case, it is important to know the benefits of using a space maintainer and how it can help support your child's dental health. As the name suggests, this appliance maintains the space for a permanent tooth in a child. Fixed appliances that hold space when a child loses a baby molar too early. Standard of care to prevent tipping of the adjacent teeth into the space to prevent blocking out the permanent tooth from eruption.